We were able to avoid them and keep the maximum depth in the foot and a half range, and even then the bikes were able to skirt the deepest pool if so desired. The round trip for us on this trail was around 20 miles and we took a half day to complete it. Towards the end of the trail is a small loop section that skirts the other side of the creek along the canyon wall. We decided to return on this loop but we saw others going the other way on this section. I’m sure you could do this section twice and skip the section of road it loops with, but parts of the road make a fun trail as well. There are some difficult sections in this area with perhaps the most difficult section being on the road traveling East. These sections were mainly challenging for our buggy where bikes could negotiate around the bigger rocks etc. At the end of the trail where we looped around there is a fun area for kids to play in the creek. The slickrock makes a sort of waterslide. By the time we worked through the difficult part of the trail we were hot and ready for a cool break in the creek. 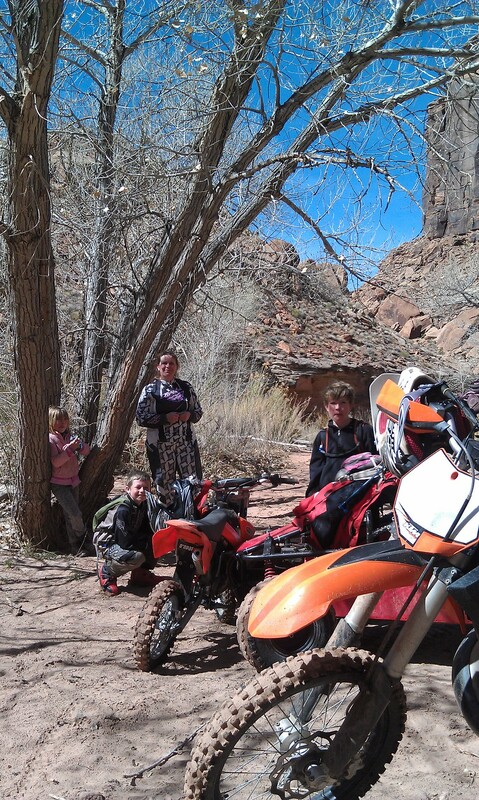 The entire trail is very scenic and fun, but this section was my favorite with the steep walls, technical sections, and even a small bridge over a gap in the canyon just wide enough for our buggy. There are camping areas near the trailhead, some are free and some are pay sites. We camped in a free site near the creek and really enjoyed the area as well as a few of the other trails nearby. Type: Double Track and Jeep Trails, numerous river crossings combined with a section of 50” atv trail. or click for Directions To Trail Head from your location then follow the route as detailed on the map below.